The first in the series. Read the words below or listen to our session here. He Buddha gave his first sermon to the Ascetics who have followed him through the forests for seven years. They had suffered greatly in their pursuit of understanding. The Buddha’s enlightenment, revealed to him an understanding about suffering. His realisation of the four noble truths; that, actually, life contains suffering for all of us. There is a way out of this suffering and it is the understanding of why we suffer that leads us out. Through acceptance and adjusting our response to life we can let go. This is a difficult path to follow and although the ascetics understood it and actually became immediately enlightened when they saw the wisdom of it, for the rest of us, the path to this point is very difficult. To help us, the Buddha presented the eight fold path. The components of the eight fold path are not to be seen as individual steps. But they intertwine and support each other and we come back to each component time and again on our journey. We can see enlightenment as ultimate wisdom/understanding and of course, wisdom unfolds piece by piece. Over the coming eight weeks we are going to look at each of these components and how they relate to us in this modern world of ours. We can see the eight components split into 3 parts. We are going to start with right view. Why? Well to put it simply, when you set out on a journey you do need an idea of your direction. 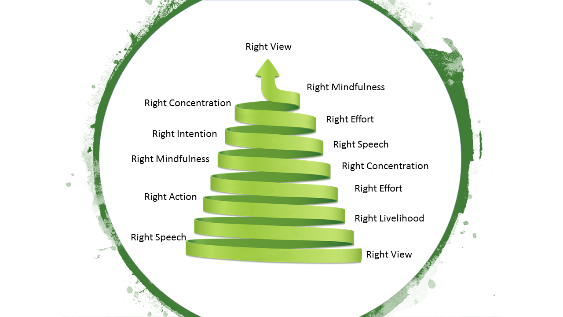 The eight fold path actually starts and ends with right view. But how can that be? How can we have the right view at the start when we haven’t completed the path? We haven’t achieved enlightenment? Well, none of the factors in the path are fixed and static. What would be the point of the path if they were? There would be no learning to be done. So the view we hold at the start will definitely gradually change and be refined into the final right view. But if there is a right view, why didn’t the Buddha just tell us what it is and we can be immediately enlightened? The truth is, the view has to be ‘felt’. It is not an academic thing. It also may well present itself slightly different to each of us, when we discover it. As our practice progresses, our right view will also deepen. At the beginning, it may well be quite mundane. Our view will centre on perhaps morals and ethics and understanding the Dharma and its direction that it provides. Certainly the four noble truths give us some place to start but there will be much more in our initial right view than this. As we progress through right view, we may have to start to let go of some of the things that we have built our spiritual practice around. Slowly, the importance around things that we have held on to will start to lessen. So our dependence on ritual and perhaps beliefs in supernatural things or superstitions we have may start to evaporate. I remember some years ago a young lady joined our Buddhist group back in Hertfordshire. When she first arrived she very honestly said that she came to Buddhism because of her love for the potential psychic abilities it may give her. She was looking for magic. However, as her practice deepened she let go of this and gradually she moved away from it and loved pure mindfulness meditation. She discovered the magic simply in the breath. To look at right view in Buddhist practice, we often use the word ‘wholesome’. So we can look at our thoughts and actions and ask if they are wholesome practices. What do we mean but wholesome and unwholesome? In truth there are many thousands of examples here but the Buddha gave us a list of unwholesome things as a starting point. As we step through these we can say that they become more related to mind and more subtle. Possible more easy to fall into? One would hope that we will all understand the unwholesomeness of destroying life. The root of all these unwholesome actions are greed, aversion and delusion. These we all suffer with. But what about wrong view? What is meant here? Didn’t we start with right view? As we progress our understanding of both right view and wrong view will become more subtle. Life gets complex. In order to avoid hurting one person, we sometimes end up hurting others. Learning to pick our way through this gets very difficult. But when we follow this path we find that we start to ‘feel’ something. To feel a difference in our life and our understanding of it. This is called the ‘ripenings’. All of these unwholesome actions (and their opposites the wholesome ones) are all driven by the mind and they all leave an imprint on the mind. This is therefore very simple. When we choose to follow a right view, we are stepping away from unwholesome actions which damage the mind and cause us suffering and towards wholesome actions which ripen in the mind and give us happiness. In this modern world, we see many examples every day of subtle and less than subtle moral and ethical poor behaviour. It is very easy to step up on to our soap box and look with criticism at this. How many times do we see examples of this on social media. Even in Buddhist forums I see examples of people trying to be the ‘best Buddhist’. Grandstanding their position over others. In many ways this is touching lots of the elements of the above list. Certainly, it is harsh speech. By making themselves look good, they stamp on someone else opinions. But this type of behavior does not take us forward along the eight fold path. This is causing us damage. Our journey along the eight fold path can only be made by us. Stepping on others won’t help us. So today, we are going to first of all get a little impression of what our personal right view is, before we step into our meditation, the mindfulness of breathing.